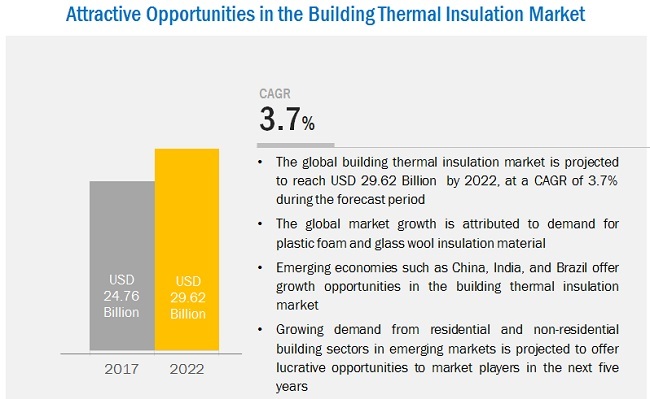 [170 Pages Report] The building thermal insulation market was valued at USD 23.89 billion in 2016, and is projected to reach USD 29.62 billion by 2022, at a CAGR of 3.65% from 2017 to 2022. Building thermal insulation is used to reduce the amount of power that is required to heat or cool a home and for minimizing the heat escape in winters and hot air penetration in summers. Building insulation tends to be the most cost-effective measure in climates that have a wide range of annual average temperatures. In this report, 2016 is considered the base year, and 2017-2022 as the forecast period to estimate the market size of building thermal insulation market. According to US Environment Protection Agency (EPA), green buildings involve the practice of creating structures and using processes that are environmentally friendly and resource efficient throughout the life cycle of a building – including siting, designing, construction, operation, maintenance, renovation, and deconstruction. There is a growth in the construction of green buildings globally due to volatile and high energy prices, concerns regarding environmental impact, and health and comfort of occupants. In addition, green building rating systems, such as Building Research Establishment Environment Assessment Methodology (BREEAM) in the UK, Leadership in Energy and Environmental Design (LEED) in the US and Canada among other countries are other factors increasing the construction of green buildings. Therefore, an increase in green building projects is expected to increase the demand for building thermal insulation, globally. The companies operating in the building thermal insulation market include Johns Manville Corporation (US), Saint-Gobain S.A. (France), BASF SE (Germany), Kingspan Group plc (Ireland), Knauf Insulation, Inc. (US), Owens Corning (US), Huntsman Corporation (US), Rockwool International A/S (Denmark), Firestone Building Products Company (US), Cabot Corporation (US), Dow Corning Corporation (US), Covestro AG (Germany) , URSA Insulation, S.A. (Spain), Paroc Group Oy (Finland), Atlas Roofing Corporation (US), GAF Materials Corporation (US), Lapolla Industries, Inc. (US), Beijing New Building Material (Group) Co., Ltd. (China), NICHIAS Corporation (Japan), Fletcher Building Limited (New Zealand), ODE Industry and Trade Inc. (Turkey), Aspen Aerogels, Inc. (US), Trocellen GmbH (Germany), Recticel SA (Belgium), and KCC Corporation (South Korea). In May 2016, Saint-Gobain S.A. acquired Buitex Industries (France) that specializes in the manufacture of wood fiber insulation products for France and continental European markets. This acquisition helped to expand its range of multi-material insulation solutions. In June 2017, BASF SE launched Elastospray LWP, an eco-friendly spray foam insulation. In July 2015, Owens corning announced to open a new facility in Joplin, U.S. to manufacture Thermafiber mineral wool insulation for commercial, residential, and industrial applications. This report categorizes the global building thermal insulation market based on material, insulation type, and region. What are new product building thermal insulation companies are exploring? 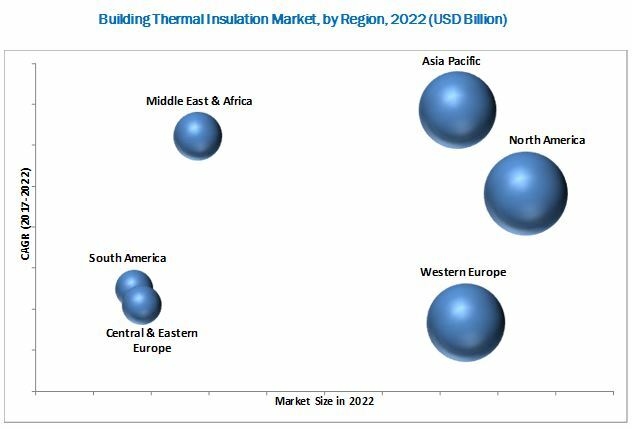 The building thermal insulation market is projected to reach USD 29.62 billion by 2022, at a CAGR of 3.65% from 2017 to 2022. 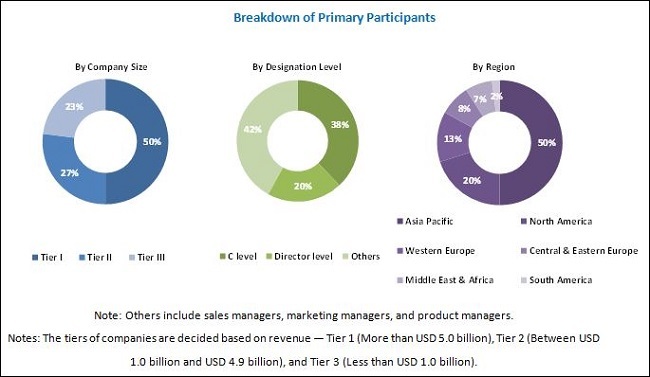 The global building thermal insulation market is driven by stringent regulations to reduce greenhouse gas emission, development of green buildings, presence of stringent building energy codes, rebates and tax credits, and reduction in energy consumption and its related cost. Building thermal insulation are materials that reduce the amount of power required to heat or cool a house. They minimize the amount of heat that escapes during the winter and limit the hot summer air penetrating into the house. Building insulation is the most cost-effective measure in climates that have a wide range of annual average temperatures. The North American region was the largest market for building thermal insulation, in terms of value, in 2016. The presence of strict building energy codes, along with the strong demand for building thermal insulation from housing sector in the US drive the growth of the building thermal insulation market in this region. In addition, the presence of some of the major market players, such as Johns Manville Corporation (US), Saint-Gobain S.A. (France), Knauf Insulation, Inc. (US), Owens Corning (US), Huntsman Corporation (US), Rockwool International A/S (Denmark), Firestone Building Products Company (US), Cabot Corporation (US), Dow Corning Corporation (US), Atlas Roofing Corporation (US), and GAF Materials Corporation (US), drives the building thermal insulation market in the region. Wall insulation is attached to or placed within walls. Wall insulation makes heating or cooling the room easy. It also helps minimize the amount of noise that enters or leaves the room by making the room soundproof. Wall insulation is subdivided into external wall, internal wall, and cavity wall insulation. External wall insulation is a thermally insulated, protective, decorative exterior cladding system to achieve the requisite thermal performance along with a protected weatherproof finish. Internal wall insulation is suitable for an individual flat or room. Cavity walls consist of two skins separated by a hollow space. Cavity wall insulation reduces heat loss and thus helps in decreasing space heating cost. It is one of the most effective and efficient insulation measures for domestic and industrial buildings. Roof insulation helps prevent heat loss through ceilings. It is a simple and effective way to reduce energy consumption. Roof insulation is subdivided into flat roof and pitched roof insulation. Flat roof is a covering of a building, which is nearly horizontal. It is the most efficient way to construct a roof as all room space can be used fully (both below and above the roof). Most buildings with flat roofs are non-residential such as logistics centers, supermarkets, factories, and airports. GAF Materials Corporation (US) is one of largest manufacturers of residential and commercial roofing products in North America. A pitched roof is a roof for which one or more roof surfaces are pitched more than 10° and alternately a roof with two slopes which meet at a central ridge. The materials used for roof insulation include glass fiber, stone wool, polyurethane (PUR) foam, expanded polystyrene (EPS) foam, and extruded polystyrene (XPS) foam. Floor insulation is used for both thermal and sound insulation and is mounted in the interstitial spaces between the floor panel and under floor panel. Floor insulation is used to reduce carbon dioxide emission and to improve the energy efficiency of the building. What are the upcoming product type of building thermal insulation market? Hempcrete is a mixture of hemp fibers and cement-like binders which can be used for building thermal insulation. It is an environmentally friendly. Hempcrete has increasingly become popular in Europe among building professionals and engineers. It provides resistance to heat and manages moisture in buildings. Thus, its availability acts as a restraint for the conventional building thermal insulation market. The competitiveness of the building thermal insulation market is continuously increasing with new product launches, acquisitions, and expansions. Strategic developments are mostly undertaken by major players such as Johns Manville Corporation (US), Saint-Gobain S.A. (France), BASF SE (Germany), Kingspan Group plc (Ireland), Knauf Insulation, Inc. (US), Owens Corning (US), Huntsman Corporation (US), Rockwool International A/S (Denmark), Firestone Building Products Company (US), Cabot Corporation (US), Dow Corning Corporation (US), Covestro AG (Germany) , URSA Insulation, S.A. (Spain), Paroc Group Oy (Finland), Atlas Roofing Corporation (US), GAF Materials Corporation (US), Lapolla Industries, Inc. (US), Beijing New Building Material (Group) Co., Ltd. (China), NICHIAS Corporation (Japan), Fletcher Building Limited (New Zealand), ODE Industry and Trade Inc. (Turkey), Aspen Aerogels, Inc. (US), Trocellen GmbH (Germany), Recticel SA (Belgium), and KCC Corporation (South Korea), among others.